Having trouble filling out your bracket? With upsets, sleepers and Final Four picks, as well as breakdowns of all our local teams in the field, we're here to help. If you’re sitting around agonizing over your brackets, we’re here to help. Before the games tip off, WTOP sports anchor Dave Preston and digital sports editor Noah Frank break down the local teams in the field, potential early-round upsets, sleepers that can make a run and Final Four picks. Maybe you’ll nod along. Maybe you’ll scoff aloud. Maybe you’ll find something you hadn’t thought about that helps push you one way or another in your decision-making. Just remember — if we help you get your picks right, you’re welcome. If we mess up your otherwise pristine bracket, we were never here and you didn’t read this. See our upsets, sleepers and Final Four picks in the gallery, then keep reading below for a breakdown of our local teams in the field. Dave Preston: Yale. LSU was in the top ten before coach Will Wade was served a subpoena by the federal government and a suspension by his school regarding the recent FBI investigation. The Tigers then wilted in the SEC Tournament. 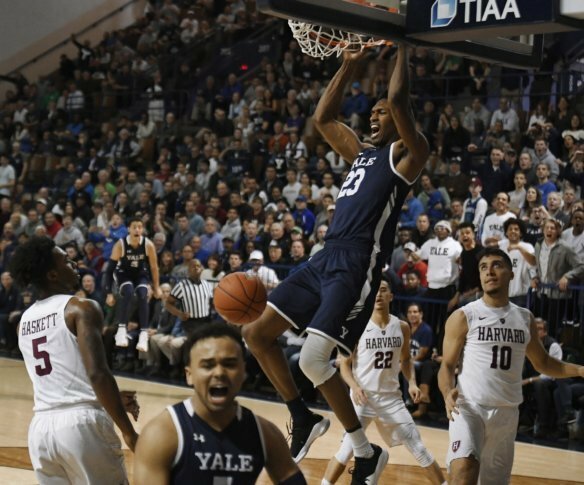 While they have the clear edge talent-wise over Yale, the circumstances surrounding the program aren’t the recipe for a deep tournament run. Noah Frank: I like Belmont to prove worthy of its at-large selection and not only make its way out of Dayton, but win two more games before ducking out to Michigan State in the Sweet 16. Virginia’s been waiting a year for this. They got the benefit of a pretty soft half of their region, and could well avoid a real test until Tennessee in the Elite Eight. Not that they’re looking past anyone. But Virginia’s path to the first Final Four (and, maybe, title?) of the Tony Bennett era isn’t hard to map. Star point guard Justin Robinson’s return from a foot injury makes the Hokies one of the more intriguing teams in the field. He’s clearly not back to 100 percent, but how much can he give? Will Virginia Tech be able to integrate him back into the offense seamlessly? How long will they have to try to figure it all out? Then, if they can make the second weekend, do they have what it takes to bring down Duke? Maryland’s got perhaps the best looking path for potential success, facing a play-in team, then a potentially in-turmoil LSU squad with no tournament experience. But the Terps have been mercurial all year, struggling to win games that seem like gimmes. Their limp to the finish line (5-5 in their last 10, 6-7 in their final 13) was capped off by a lifeless loss to an undermanned Nebraska club. That has to change. The Rams got two good pieces of news — they avoided a play-in game, and get all the way until Friday night for star point guard Marcus Evans to shake off the bone bruise that knocked him (and VCU) out of the A-10 Tournament. They should beat a green UCF team that barely made the field, though it would be the shock of the tournament if they could knock off Duke. That’s just a tough draw for a team built to be a giant-killer. Don’t sleep on the Monarchs, who slipped VCU at home and Syracuse up at the Carrier Dome in the non-conference schedule. They’ve got surprising size for a mid-major with two seven-footers, so they won’t be overwhelmed by Purdue’s size. And they’ve got a pair of senior guards in BJ Stith and Ahmad Caver, which is always a recipe for success in March.